WATERTOWN, Wis. -- Improvement, perspective, intentionality, and ownership. These (among others) are concepts that Coach Dave Anderson models for and develops in the student-athletes on the MBU Women's Soccer Team. Anderson has two seasons as a head coach under his belt. Before stepping into the head role for the women, Anderson was a three-year assistant coach on the men's side and was a part of the 2014 national championship team. While he only has two seasons to his name as a head coach, Anderson has already proven himself to be a step above competent in the role. "Dave is the total picture," said Coach Jeff Pill, head coach of the men's team. "He excels in leadership development and he cares for the development of each player. He has a clear philosophy and core belief system, which keep him grounded and focused. He is knowledgeable of the tactics of the sport, and actively pursues opportunities to hone his craft." To gain a better understanding of his coaching philosophy, we at mbusabercats.com sat down with the third-year coach to understand his mindset at the head of the program. M: What's something you emphasize to the players? DA: "One of the beliefs that has become foundational to our program is the belief that each member of our program always has the opportunity to improve. As players, as coaches, and even as people, we have never arrived - there is always room for growth. I think the elusiveness of mastery in sports is partly what makes the experience so compelling. So, the pursuit of improvement has become a constant theme for each one of us." M: What's your goal for a Maranatha student-athlete by the end of their career? DA: "My goal for each player is primarily that they would take the principles of accountability and intentionality that we model and teach on the field and apply it to all areas of the personal and professional lives. 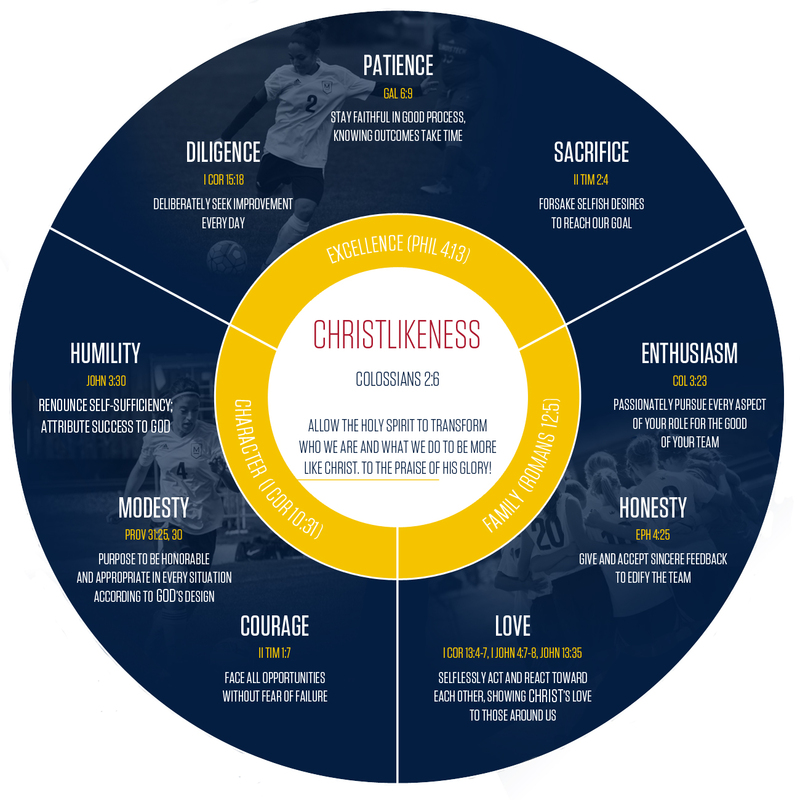 Soccer does a lot more to reveal our character than it does to necessarily shape our character. But our response to adversity on the field is really where we can grow, and that translates well to all of life. I hope the players are able to implement that process from soccer into whatever arena of life God places them." M: What do you to reinforce your team's core belief model? DA: "Beyond player-initiated accountability to the core beliefs, I think we have reinforced the validity and relevance of our core beliefs with our end-of-the-year awards. Typically, sports teams will give awards based on athletic achievement, and I do not dispute the merit of that type of award system. However, I felt it was important to honor the players that exemplified the core beliefs to which we are all aspiring. We divided our nine core beliefs into three categories when we first compiled the list, so we don’t end up giving out nine individual awards. Although I will admit, with the caliber of people we have in our team, I think we could easily give out that many individual awards. I’m impressed with how the players have strived toward mastery in these key areas." M: How do you select captains? DA: "The captain selection process varies every year, but there are some constants. For instance, we've always given the players an opportunity to voice their opinion about who they want as their captain through a vote. We reserve the final decision for the coaching staff, but the player votes are given a lot of weight in that decision. In fact, in my time as head coach, I do not think we have ever reversed or altered a vote from the players. This speaks to the perception of all the players and the quality of leaders who have stepped up through their careers at MBU. I think each team is different, therefore, the responsibilities of the captains will also change according to the nature of the team." M: What are your goals for the captains? DA: "I want captains to take the reins of the team culture. Most importantly, I want them to drive the training atmosphere for our team. The captains, not me, are the ones who will be on the field with their teammates in the thick of the battle so to speak, so I want them to assert their leadership during training in that regard as well. I have been really impressed with the leadership and example of our captains in my first two years with the program. I love how the elevation of the role also elevates the awareness of responsibility. Our captains have blossomed in that pressurized position." M: What makes the Women's Soccer program unique? DA: "I think a great advantage of being one of the first sports in the school year is the lack of academic pressure, comparatively. Most classes do not have major projects due until the end or after soccer season, so our student-athletes’ brains aren’t 'mush' during soccer season. Also, because of the timing of our season, we are able to enjoy pre-season before school starts. Those were some of my favorite memories as a player, and it continues to be one of my favorite times of year as a coach. It’s just soccer all day, every day!" M: What makes MBU unique for student-athletes? DA: "At MBU, student-athlete does not have to be your only 'identity'. I loved that element when I was a student because it allowed me to explore different fields through my educational experience. Most of our players are involved in significant other extra-curricular activities, even during soccer season. Some are involved in choirs, some are in society leadership, some are in dorm-leadership, and others have great opportunities to serve in the local churches they attend at school. Yes, this puts more demand on our schedules and our prioritizing of commitments, but I think that process is also quite valuable. Not to mention, college is a great season of life to learn in this demanding environment."